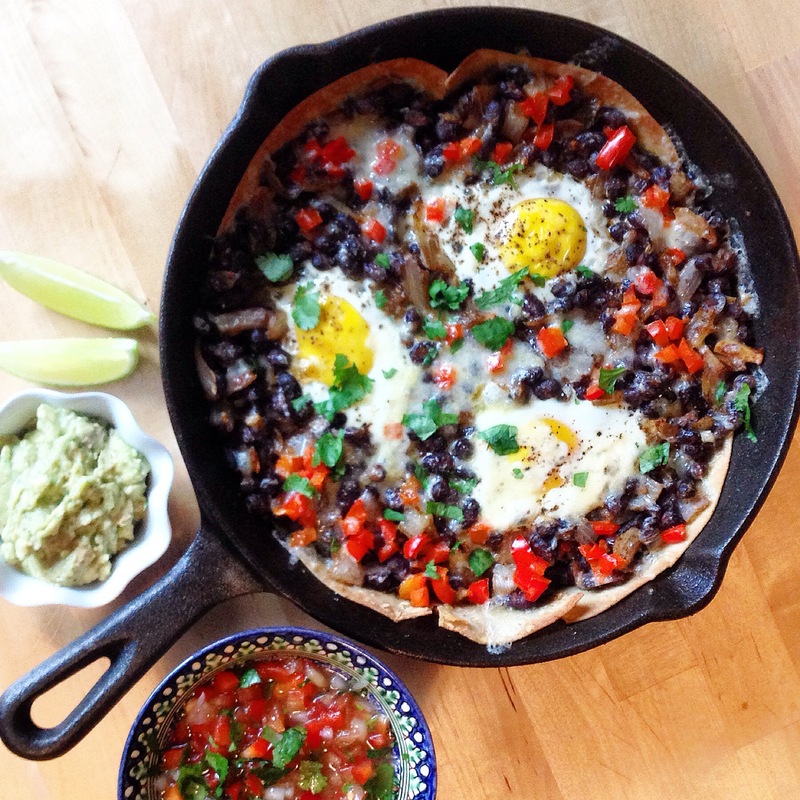 Huevos Rancheros, or “Rancher’s Eggs” is a bright and vibrant, one pan meal perfect for breakfast, brunch or dinner and a lovely, easy option when cooking for guests. This classic, beautiful skillet comes with a vast variety of options as far as ingredients go. My recipe today is a simplified version. I’ve included instructions for a lazy salsa and guacamole. Feel free to add as you wish; rice, other types of beans, more vegetables, or meat – pretty hard to go wrong here. This is a nourishing, balanced meal with both raw vegetables and fermented food if you add sour cream, meaning plenty of active enzymes, easier digestion and better absorption of the many nutrients it contains. 1 Small BPA-free can of Black Beans (or your own soaked and cooked beans if you have them available). Shredded cheese of your choice – I love old cheddar. Slice of onion for the one listed above. Heat coconut oil (or olive oil) in skillet on medium/low heat. Add to the hot oil, the chopped onion *save a bit of onion for the salsa. Turn on oven to 400F. Once onions are a bit soft (about 4 minutes) add in chopped garlic, black beans and taco spice. Stirring frequently allow these flavors to cook and blend together for a couple of minutes. Turn off the burner and empty the skillet contents into a bowl. Return the skillet to the burner that is now off and add in a decent amount of olive oil. Brush the sides of the pan with oil as well as all sides of all tortillas. Place the tortillas into the bottom of the skillet, pushing gently to follow the shape of the pan. Spoon the bean mixture on top and smooth out to even. Make equal amount of wells into the beans as you have eggs. Gently (don’t break the yolk!) crack the eggs into the wells. Sprinkle on a small handful of chopped red pepper, and salt and pepper. Put into the oven for about 15 – 20 minutes. While this is baking you can make the lazy (and simple and fresh and delicious) salsa and guacamole. Salsa: finely chop the red pepper, tomato and cilantro, mix with a bit of olive oil (like a teaspoon or two) and half the juice of ½ a lime. Guac: mash avocado with a few crunches of black pepper and sea salt and the other half of the juice from ½ a lime. A minute or two before the eggs are cooked to your liking, take out the skillet and sprinkle on the cheese. Return to the oven for a minute or two so the cheese gets all melty and the eggs are cooked. Place the skillet on the table and sprinkle with cilantro. Serve with hot sauce, sour cream, salsa and guac and love your life!